CSUN alumnus Homero Magaña M.A. ’12 (Educational Administration) introduced First Lady Michelle Obama at the White House College Opportunity Day of Action in Washington, D.C., joining hundreds of other national education leaders, including CSUN President Dianne F. Harrison. 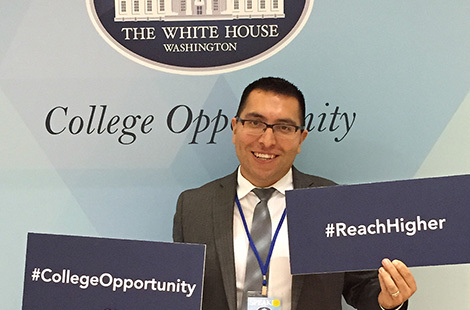 Read more about the College Opportunity Day of Action. CSUN will host its 18th Annual High School Art Invitational from Jan. 12 to 31. Students and faculty from more than 30 San Fernando Valley high schools will display their art. Read more about the invitational. The David Nazarian College of Business and Economics at CSUN has maintained its business accreditation by AACSB International, a distinction earned by less than 5 percent of the world’s business programs. Read more about the re-accreditation. Thu., Jan. 15, 7 p.m.
Fri., Jan. 16, 8 p.m. Tue., Jan. 27, 6:30 p.m.
At CSUN, graduate nutrition students have created a central hub, known as the CSUN Nutrition Experts website, for reliable information to help anyone stay healthy. This event will be an opportunity to meet, mingle and network with Black Alumni of CSUN. CSUN hoops fans can enjoy a new premium seating option for a more robust in-game experience starting Jan. 17.